Tortillas are a staple in my kitchen and they make a perfect, easy crust for pizzas. If you have little ones, let them top their own pizzas—it will be a fun way to get them involved. 2. Spread tomato sauce evenly among the 4 tortillas. Sprinkle each with basil, garlic powder, and salt. 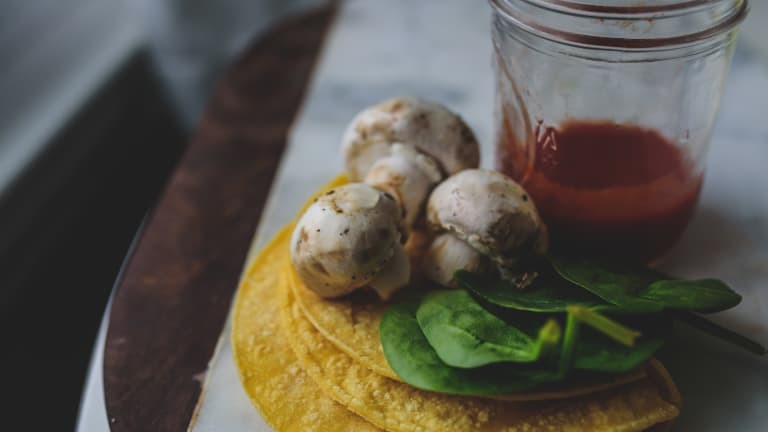 Top each tortilla with chopped roasted red peppers, mushrooms, and spinach. Top each with shredded mozzarella. 3. Place tortilla pizzas on cookie sheets and bake for approximately 6-8 minutes or until cheese is melted and slightly browned. Slice and enjoy!